The art of magic is about creating an illusion that the audience will have no choice but to sit in awe at something they believe to be impossible unfold in front of their very eyes. The job of the magician is to create that illusion while holding within the confines of what truly is possible to achieve. J. Daniel Atlas (Eisenberg), Merritt McKinney (Harrelson), Henley Reeves (Fisher), and Jack Wilder (Dave Franco) are considered to be the best in the business at creating these illusions although each in their own special way. Thanks to these special talents, the four individuals are brought together and invited to participate in a series of tricks that, if pulled off successfully, will shock the entire world and make them all rich beyond their wildest dreams. 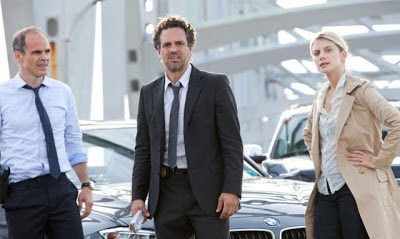 After the first of these tricks involves the foursome performing on a Vegas stage show while somehow pulling off a bank robbery on another continent, detective Dylan Rhodes (Ruffalo) begins an investigation into how a crime of this magnitude could have been pulled off. As Rhodes begins hunting down leads, he is forced to work with Interpol agent Alma Dray (Mélanie Laurent) who seems just as intent on solving the mystery of these mischievous magicians as he is. 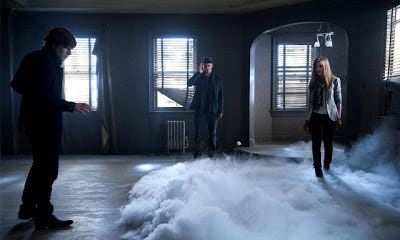 Thus begins a game of cat and mouse deception and smoke and mirrors trickery that will leave the entire world in awe of how four upstart tricksters could become legendary magicians after attempting to pull off the biggest deception the world has ever seen. For a movie like this to work, the primary characters need to be cast perfectly and I must say whoever was in charge of picking these fine folks did a terrific job. Normally, I'm not a huge fan of Jesse Eisenberg, but his portrayal of the not quite overly confident J. Daniel Atlas is so perfect that you completely buy into his acts of deception and he fits in perfectly with co-stars Woody Harrelson, Isla Fisher, and Dave Franco. As a counter to the bluster and flash of the four magicians, Mark Ruffalo and Mélanie Laurent play their characters with a hard nosed and determined tenacity that leaves you wondering which side you should be rooting for as the story plays out. Morgan Freeman, Michael Caine, and Common round out one of the best ensemble casts put together this year. Again, kudos to the casting department for a job well done. As a director, Louis Leterrier has been hit or miss over the years although, with only five movies under his belt, he seems to be getting better and better as time goes by. While his take on the Hulk was truly incredible, his version of Clash of the Titans failed to continue that smashing success. Fortunately, he was able to take some time between pictures to get back on track and has found himself behind the lens of one of this year's smartest and most enjoyable movies. Now You See Me is filled with fast paced action that is balanced nicely with an intelligent story and some really fun performances. The pacing will have you on the edge of your seat, keeps you guessing at all the unpredictable twists and turns, and the story itself becomes part of a puzzle that stays nearly unsolvable until the very end.